There’s a building threat from the nation’s two retail drugstore giants to hospitals and health systems as providers move toward value-based care and lower-cost outpatient services. Even with Amazon threatening to compete with retail drugstore chains CVS Health and Walgreens with its own online pharmacy, these retailers aren’t giving up on brick-and-mortar as a way to attract more patients into their stores. And that’s bad news for the nation’s hospitals and health systems. There’s a building threat from the nation’s two retail drugstore giants to hospitals and health systems as medical care providers move away from fee-for-service medicine to value-based care and lower-cost outpatient services. Walgreens and CVS are looking to healthcare as a way to keep customers coming into their stores, particularly in an era where consumers are fleeing brick-and-mortar to shop online via Amazon. As front-end retail sales have fallen in recent years, CVS and Walgreens are moving more rapidly into healthcare from simply their historic role of filling prescriptions beyond the pharmacy counter and treating routine maladies with nurse practitioners in their retail centers to more services. They are partnering more closely with health insurance companies that will work harder to funnel more patients to outpatient healthcare services inside the stores that will make them direct competitors of U.S. hospitals and health systems. CVS has more than 1,100 retail MinuteClinics compared to 800 five years ago and 400 a decade ago. CVS was opening 100 clinics per year 10 years ago, and that has slowed because they are now focusing on expanding healthcare services in the clinics as well as their stores generally. The same goes for Walgreens. Walgreens has increased the services in its retail clinics, advertising the ability of nurse practitioners to conduct routine exams and student physicals and has been aggressively lobbying states across the country to change scope-of-practice laws to allow pharmacists to administer an array of vaccines. To be sure, Walgreens is looking to provide more physician services like x-rays and procedures by partnering with UnitedHealth Group’s Optum to connect its MedExpress brand urgent care centers to an adjacent Walgreens. Like most retailers, Walgreens’ sales of general merchandise in the front end of the store is falling just as pharmacy sales, personal healthcare, and wellness revenues rise. In the first such ventures, the Walgreens store and the MedExpress center each have their own entrance with a door inside connecting the urgent care center with the drugstore. It’s designed for a medical provider to guide a patient to either facility depending on their prescription or other needs. For now, there are 15 locations in six states that have MedExpress urgent care centers connected to Walgreens stores as part of the pilot. The markets include Las Vegas; Dallas; Minneapolis; Omaha, Nebraska; two cities in West Virginia; and Martinsville, Virginia. Meanwhile, CVS plans to offer more healthcare services inside its stores after its merger with Aetna closes. CVS executives say they aren’t ruling out developing urgent care centers as well. CVS’ network of nearly 10,000 pharmacies and over 1,000 retail clinics, and Optum’s growing network of ambulatory facilities like the MedExpress urgent care centers are emerging as a model health insurers want to do business with as fee-for-service medicine gives way to value-based care that keeps patients out of the hospital. And in CVS’ case, the pharmacy will soon own Aetna, a health plan with more than 20 million members. That combination, which is currently wending its way through the regulatory process, is expected to lead to more narrow network health plans that encourage patients to use providers in the Aetna-CVS network over other health systems’ facilities. Health systems should be concerned, healthcare analysts say. CVS Health President and CEO Larry Merlo is beginning to offer some details to their strategies. While cautioning that it’s “very early” in the development of new programs the combined company will develop, Merlo has said the larger company plans to first focus on three primary patient populations: those patients with any of five chronic diseases: diabetes, hypertension, hyperlipidemia, asthma, and depression. CVS and Aetna will also focus on “patients undergoing transitions in care,” and a third “broader focus on managing high-risk patients,” Merlo told analysts on the company’s second quarter earnings call in May. “By extending our new health care model more broadly in the marketplace, patients will benefit from earlier interventions and better connected care leading to improved health outcomes,” Merlo said on September 20 at a CVS Health town hall meeting in Los Angeles. “Think again about that senior leaving the hospital, knowing that the care plan prescribed by her doctor is being seamlessly coordinated by CVS and her caregiver. By fully integrating Aetna’s medical information and analytics with CVS Health’s pharmacy data and our 10,000 community locations, we can enable more effective treatment of the whole patient,” he says. Every Amazon (AMZN) flirtation toward the health care industry has sent hearts racing on Wall Street. Yet Amazon appears to be having commitment issues, and others have leapt while Jeff Bezos hesitated. Now comes a possible Walmart (WMT)-Humana (HUM) merger. A Walmart acquisition of the insurer could fundamentally reshape health care delivery in ways that Amazon may have trouble matching. A Walmart-Humana deal could potentially transform the health care market for seniors, a demographic that is critical for both companies. 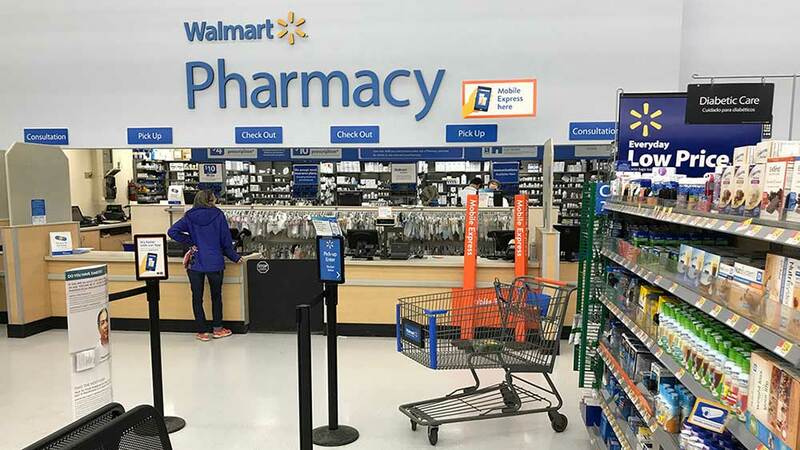 Walmart already operates about 4,500 in-store pharmacies and 2,900 vision centers, but a Humana deal would likely accelerate its efforts in developing in-store clinics. The clinics haven’t been a knockout success, but Walmart has been learning, wrote Tracy Watts, U.S. health reform leader at Mercer, in a blog post. “This partnership could foster new ways to bring people what they want and need,” she wrote, highlighting health care access in rural areas. CVS Health (CVS), which is in the process of acquiring Aetna (AET), is planning to revamp its drugstores to provide more health services. Walmart has greater financial wherewithal to execute the strategy and its supercenters may be a more natural fit for health services. A Walmart-Humana tie-up has strategic merits for the retail giant, wrote Stifel analyst Mark Astrachan. He expects it would drive greater store traffic and produce health care cost savings, helping the discounter to keep investing to fend off Amazon. Savings would come from closer ties to Humana, the largest remaining independent pharmacy benefits manager. That would help to reduce drug prices for Walmart’s 1.5 million U.S. employees, Astrachan wrote. Humana recently purchased a major stake in the home health care business of Kindred Healthcare, a natural fit for Walmart’s home delivery business. Still, there would be challenges. Piper Jaffray analyst Sarah James sees hurdles to staffing up clinics amid a nursing shortage that’s pushing up wages. She also questioned how attractive a merger would be for Humana. Humana has an enviable Medicare position while Walmart has a smaller store base compared to CVS Health and Walgreens Boots Alliance (WBA). Still, Humana shares rose 4.4% on the stock market today, even as the Dow Jones, S&P 500 index and Nasdaq composite all lost about 2% or more. Meanwhile, shares of Walmart lost 3.8% and Amazon skidded 5.2%. So far Amazon’s disruptive impact on health care has been all about what others are doing. Since reports last summer that Amazon might enter the retail prescription industry, the shockwaves have set in motion one deal after another. First it was CVS buying Aetna and beginning to offer same-day delivery in major markets, and next-day nationwide. Albertsons grabbed the Rite Aid (RAD) stores not bought by Walgreens. Last month, Cigna (CI) announced the purchase of Express Scripts (ESRX), the largest of the pharmacy benefit managers. Options to enter the prescription drug business have narrowed for Amazon but haven’t been closed off entirely. One potential avenue would be acquiring Walgreens. In January, Amazon announced a health care venture with JPMorgan Chase (JPM) and Berkshire Hathaway (BRKB). Health care stocks tumbled amid fear that Amazon would use the same formula that slayed book sellers and department stores. The scariest part: The companies say they have no intent to earn a profit from the effort. Yet they also confessed to a lack of any coherent plan for putting still-to-be-formed cost-saving ideas to work. In the first three months of 2018, there were 3,774 deals globally, totaling $890.7 billion. So far this year, there have been $393.9 billion invested in U.S. companies. Domestic activity was also particularly strong in China. Merger and acquisition (M&A) activity across the world has hit a seventeen-year-record high in the first quarter of 2018, according to a report by research firm Mergermarket. In the first three months of 2018, there were 3,774 deals globally, totaling $890.7 billion, it said Wednesday. This was the strongest start to the year since 2001, when Mergermarket began recording the data, and represents an 18 percent increase in value compared to the first quarter of 2017. “The extraordinary surge in dealmaking seen at the end of 2017 has carried through into 2018,” Jonathan Klonowski, research editor at Mergermarket said in the quarterly report, citing pressure from shareholders and a search for innovation as the main drivers. “Amazon’s move into pharmaceuticals appears to have been a catalyst for dealmaking in health care-related areas with the CVS/Aetna deal announced in December and the Cigna/Express Scripts transaction this quarter,” he added. Amazon announced a partnership with J.P. Morgan and Berkshire Hathaway’s Warren Buffett in January to reduce health costs for U.S. employees. The move has sparked fears that the retail giant could enter and compete with traditional health care businesses. As result, the sector has consolidated to fight possible future competition from Amazon. Cigna bought Express Scripts in a $54 billion cash-and-stock deal in early March. CVS also approved the acquisition of Aetna for about $69 billion in cash and stock last month. Such deals have been particularly relevant in the U.S., where M&A activity during the first quarter of the year represented 44.2 percent of the total global share. So far this year, there have been $393.9 billion invested in U.S. companies, according to the report. This represented a 26.1 percent increase from the same period a year ago. “Domestic dealmaking has been a key factor registering 952 deals worth $330.8 billion,” the report said. But it’s not only U.S. companies that seem to be consolidating in their own market. Domestic activity was also particularly strong in China, where firms spent $68.7 billion — this was the highest first quarter on record. “Domestic M&A accounts for 85.2 percent of Chinese acquisitions in Q1 (first quarter) 2018, a significant increase from the 61.6 percent and 71.3 percent seen during 2016 and 2017,” Mergermarket said. The health care sector rallied yesterday on another “Merger Monday” with the announcement of Sanofi’s (SNY) purchase of Bioverativ (BIVV) for $11.6 billion, and Celgene’s (CELG) $9 billion purchase of 90 percent of Juno Therapeutics (JUNO). But there’s still one transformative merger that will define and reshape the U.S. health care market in 2018: the CVS/AETNA $69 billion deal announced last December. CVS is best known for its 9,700 retail pharmacies and 1,100 walk-in clinics, but its most significant profit driver is its pharmacy benefits manager (PBM) enterprise—a middleman between pharmaceutical manufacturers and dispensers like drugstores. The company generated $177.5 billion in net revenue in 2016. With its purchase of Aetna, another bold company and the nation’s third largest health plan, CVS upended uncomfortable business incentives built into its business model. In theory at least, the CVS PBM has new incentive to bring down drug prices and push for the most efficacious—not necessarily the most expensive—treatment choices, to achieve more competitive insurance premiums. They can also favor common sense preventive and primary care through convenience clinics. This is what makes the CVS/Aetna deal different. It crosses sectors and realigns previously competing business incentives to better target consumer demand. Most of the merger proliferation we have seen over the past few years involves companies in similar categories within the health care industry. Providers merge with other providers, health plans with other health plans, and pharmaceutical companies with others in pharma. Realigning incentives is the central problem in the health care marketplace, which is built on thorny knots of unintended consequences and senseless rules that resist untangling. The most famous of those knots are fee-for-service payment rules, still largely dominant, whereby payors reimburse for any and all services, regardless of quality. Among its hazards, fee-for-service incentivizes infections because it results in more care and thus pay better. Nobody thinks that is a good idea, but the business model is extremely difficult to unravel. CVS seems up to the challenge. CVS Chief Executive, Larry J. Merlo, is the man for the job. His signature style is a laser-focus on the company’s core mission of “helping people on their path to better health,” which he is determined to accomplish even when short-term profit incentives nudge in a different direction. That was why Merlo led CVS to discontinue tobacco sales in 2014, and why CVS recently banned digitally altered photos on cosmetic products sold in their stores. Maybe it sounds logical that a health enterprise shouldn’t sell cigarettes or promote eating disorders and depression, but it takes unusual courage to turn away lucrative business. Many greeted the news of the CVS/Aetna merger as a play to head off new ventures coming from Amazon or other new players. But what makes me optimistic about this particular deal is the new company’s combination of health industry and retail savvy. Many companies have one but not the other. Enterprising outsiders often enter the health care industry with good backing and an idea that would definitely help patients, only to end up six feet under the health care lobbyists, special interests, regulatory twists, and perverse incentives that have dogged the health care system over decades. There are large graveyards full of great companies that naively believed that normal business models work in health care. CVS is not naïve.